I now have two Sapphires! And congrats on the Sapphire Mule, those are super-rare ! Last edited by archimedes; 11-30-2012 at 09:43 AM. I had bought 1 for my daughter for university last year and she did use it, but then it got lost in her "packing". I recently found it at home and have been using it. Very handy indeed. Almost too bright at 2 am when I am heading downstairs to check on the dogs. I will post results of the runtime test when I've done it. I don't have any special equipment, so it'll just be the number of hours! Haven't tested a Lithium battery yet, but got 5 hours 58 minutes on an Eneloop until I stopped the test due to obvious reduction in output. The voltage on the Eneloop HR-4UTGA then measured exactely 1,0 Volt. This runtime is about the same as on an alkaline before output starts dropping according to this post: (http://www.candlepowerforums.com/vb/...e-quot-25-quot) Lithium should do better but nowhere close to the theoretical 48 hours! I have done a runtime test with an Energizer Lithium primary battery. Total 11h 55 min and the last hour or so there was obvious dimming with Finaly only a faint glow the last minutes. As far as runtime goes with the AAA flashlights: For single level lights I'm happy with this type of runtime! The ARC P ran about 7hours until empty on a lithium primary. In multiple mode flashlights the runtime on low is largely irrelevant to me. Let me explain: I always use the higher levels at least sometimes, so I don't have a "guaranteed" runtime except the high level. That's also why I love these single level AAA flashlights with good runtimes. One notable exception is the Muyshondt Mako which runs more than 20 hours on high and 80 on low with a lithium primary, but the high has less total output than my Sapphire GS judged by ceiling bounce, so it's no surprise that its runtime is longer even on "high". I'm pleased with the runtime and the fact that it doesn't just cut out as was suggested in another post. This might be because this was a continuous runtime-test and not intermittent usage. I Love my Sapphires more than any other flashlights at present and they are truly EDC ie I always have one on me (not EDC as in when I carry a flashlight this is the one I choose). Last edited by Maxbelg; 12-12-2012 at 03:35 PM. I received my Sapphire from Don a few days ago. You guys all know this already, but Don is top notch! This little light is absolutely beautiful, and it arrived within days of ordering. Email sent. I am ready to start improving my flashlight collection. Which version of the Haiku would you recommend? All of the different options are still a little confusing. What are the pros and cons? I am a complete newbie, with a Sapphire, and a couple of 10440 batteries. Can I use these in the Sapphire? The converter in the sapphire can handle up to 4.5 V as I recall. Min V-in is somewhere around .8 -.9 V. The Sapphire was designed around the AAA battery geometry. Not knowing anything about your 10440 batteries, I don't know if this information helps or not. Cheers Mc, the batteries are 3.7 volt, that should not be a problem than. If it gets too hot I will turn it off. I love the light, also saved enough to get a Haiku, just standing on the edge of buying one. Ps Just tried it, the little plus knob couldn't get past the +/- safety sponge, Im gonna stick to the safe side and keep using the eneloop. Last edited by zeppo; 04-13-2013 at 11:45 AM. I think the only options available are Nichia 119 led or XML. The Nichia will be a lot less bright but the tint is very natural. The XML is a whiter tint but very much brighter and floodier. You should ask your Haiku questions in another thread or start a new thread in the McGizmo forum. This thread is really for the Sapphire light. PM me if you want more info. Good luck! The Haiku is awesome (AWESOME). They are NOT 3.7 volts. With a full charge, they are 4.2 volts; almost dead, they are 2.7 volts. The *average* voltage is 3.7 volts. Yes, it's a goofy way to label a battery, but those are the real numbers anyway. Anyway, you should be able to use them since the full-charge voltage comes in just under the maximum rating of the driver board. If the anti-battery-rattle sponge is too thick, you can build up the solder blob in the center a bit to compensate. However, there will be no performance benefit to using a 10440 instead of an Eneloop, so it might not be worth the trouble if you already have Eneloops handy. Received my Sapphire 25 GS on Monday. This is a great little light. My first custom flashlight and defiantly not my last. Payment sent. Looking forward to getting my first custom light! Guess I should get hold of some eneloops - all this talk on the forums of alkalines leaking has made me more 'protective' of my lights. Just get some lithium primaries. They last forever in them. Pointless to hassle yourself with rechargeables. Congrats. I wouldn't say Eneloops are a hassle, I've changed mine maybe once or twice in the 18 months I've had my Sapphire GS... Lithium primaries should last even longer, so either option really ends up pretty cheap and convenient, you can't lose. Thanks guys, I went ahead with the eneloops, I guess if I was to go down that route, I may as well do it at the start. Appreciate the advice, though. Great. I personally almost exclusively use rechargeables for all my lights. I only suggested the lithium since you do not have rechargeable battery and the charger yet. And I would think many people would have trouble going thru one or two lithiums in a year, I ended up just using the lithium and not bothered with rechargeable. I think Ben's point was that for a light that you will rarely change the batteries in, tying up useful rechargeables is kind of pointless. The advantage of rechargeables becomes diminished if you only change it once a year. In other words, why bother? That was a money strike. However different people will have their own ideas about convenience.. It's arrived. It's a fantastic piece of design. Currently living on my gf's keyring. At least I know she has a torch with her. 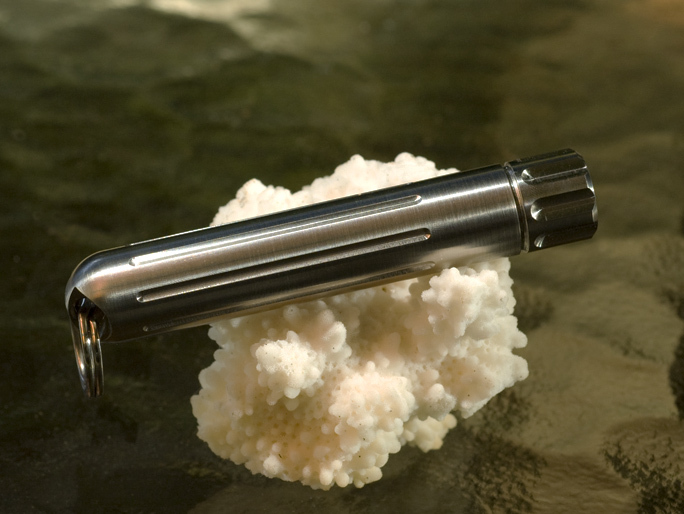 This thread is a standing wave offering for the titanium Sapphire 25 AAA flashlights. By standing wave, I mean that I hope to be able to stay ahead of demand and keep these available until further notice. Time will tell. I am holding to the same price as the original Sapphire even though the new converter used here was more expensive and I have added labor involved in the assembly. To be clear in this offering of Sapphire 25's, the only difference between these and the original Sapphire's is that of the converter used. From external view, the lights are the same. In terms of performance, the Sapphire 25 is not as bright as an original Sapphire on a fresh battery. The Sapphire 25 (25 mA drive current to LED) should give you almost 5 hours of runtime on an alkaline AAA battery with an output near 5 lumens. You will still have useable light after 12 hours but with obvious indication that it's time to change the battery!! 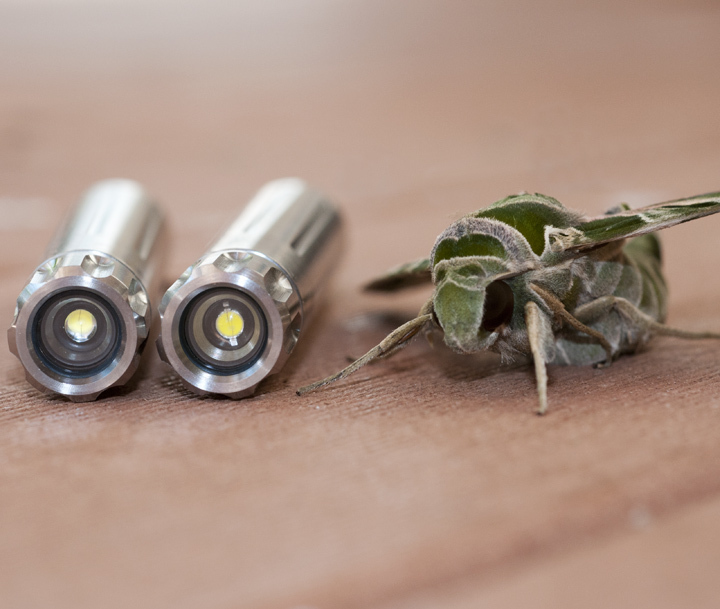 The LED used in these is the same as the original Sapphire, a Nichia 3 mm 310DS. My hope and intent is to process the e-mail orders for these on a first received/ first processed basis and ideally the response to your e-mail order will be a notification of shipment. I don't want to add to the number of communications by sending an acknowledgment prior to generating the postage notification. For my general info on how I process these offerings, please refer to THIS THREAD. For more information on the Sapphire 25, please review THIS THREAD. * shipping is via Priority Mail with Delivery Confirmation or Global Priority mail. If you wish shipping via an alternative method, or signature confirmation or insurance on domestic shipments only, please specify in your e-mail order. Now in addition to the Sapphire 25 I am offering what we can call the Sapphire GS. The only difference is in the LED itself. The Sapphire 25 uses the Nichia 3 mm 310 DS as explained in the original thread. The GS uses the new generation of Nichia 5 mm GS LED. This LED is more efficient than the 310 DS and can be driven much harder although it will be coasting in the Sapphire as the same 25 mA converter is being used. The main differences one will see is in the tint of the beam. I am using a warm LED and by virtue of the greater efficiency in the dice, the output in lumens is comparable to the cooler 310DS. Both lights will give you about 5 lumens of light and the GS might give you a bit better run time to boot. The Sapphire GS is on the right and if you look closely you can see that there is a 5 mm LED in there and not the 3 mm even though the dice look similar in size. The Sapphire GS is the same price, $150 plus postage and if you would like one of these, please designate that you want the GS . I have a limited number of these on hand at present as I have built them from a small shipment of the LED's. I have a large order of more of the GS LED's on order but it will be weeks before I get them. I guess this is a pretty hot selling LED for Nichia at present. Is this Sapphire 25 still on sale? I understand this thread has been on the Internet for several years already, ancient, in terms of today's modern technology. I've been searching the Internet for a long time and don't seem to be able to find a seller for this particular product. I even went into the McGizmo's website, but its still under construction. The only way to purchase McGizmo lights (new) is via direct email to Don. See this page (http://www.candlepowerforums.com/vb/...-Ordering-Info) for availability and specific how-to-order info. The Sapphire is still available. Thanks pjandy for the email address, and thanks to you for the link to this valuable info. I really do appreciate it very much! I did get hold of this legendary 'Don'! Would any of you choose this 'Titanium Arc-AAA LED Flashlight' instead of the McGizmo Sapphire? I understand they are both very similar. 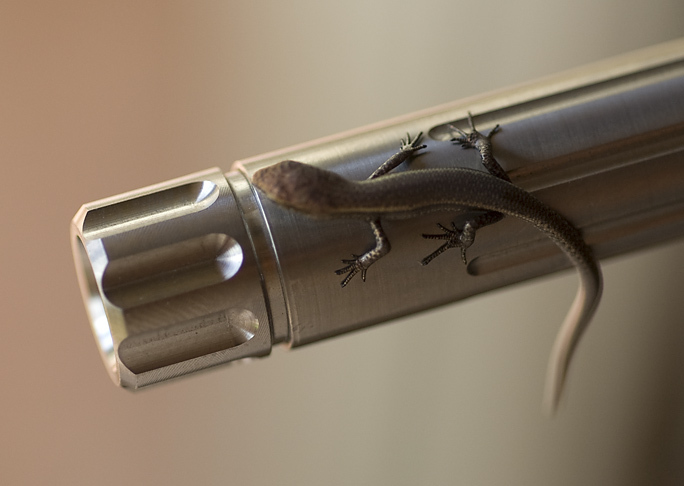 Any other suggestions for a keyring flashlight/torch? The earlier Arc version is no longer available unless you can buy it in the secondary market. The beam is a touch brighter and cooler. The present Sapphire does have a bit better runtime though. From the exterior dimensions, you can't tell them apart. 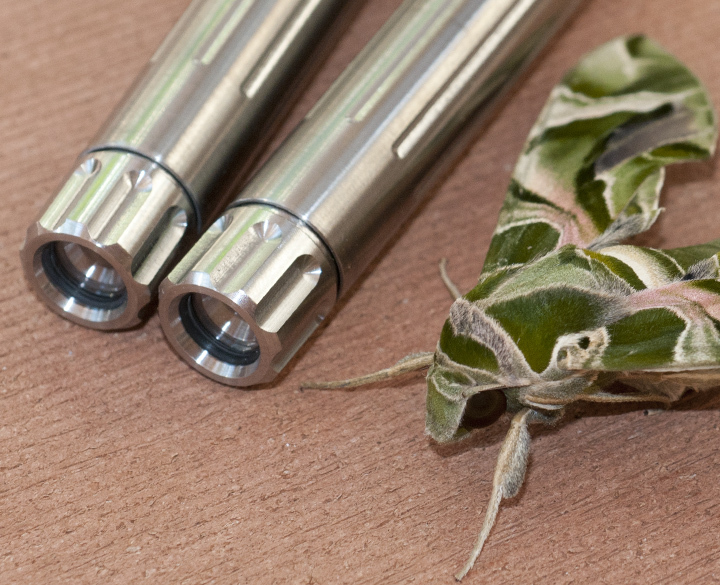 Sorry mate, but I found the 'Titanium Arc-AAA LED Flashlight' at this website http://www.arcflashlight.com/titanium-aaa.shtml. Apparently its Not a secondary market, but the original company that sells the Arc. However, I still have no doubt the Mcgizmo is a very fine product. Just hoping to hear some comparisons. Thanks!